Beautifully engraved SPECIMEN certificate from the A.C. Nielsen Company. This historic document was printed by the American Banknote Company and has an ornate border around it with a vignette of the company logo. This item has the printed signatures of the Company’s President ( N. E. Harden) and its Secretary. Nielsen Media Research is the leading provider of television audience measurement and related services, worldwide. In the United States, Nielsen’s National People Meter service provides audience estimates for all national program sources, including broadcast networks, cable networks, Spanish language networks, and national syndicators. Local ratings estimates are produced for television stations, regional cable networks, MSOs, cable interconnects, and Spanish language stations in each of the 210 television markets in the U.S., including electronic metered service in 55 markets. Nielsen Media Research is active in 40 countries worldwide, offering television and radio audience measurement, print readership and customized media research services. Nielsen Media Research also provides competitive advertising intelligence information through Nielsen Monitor-Plus both in the U.S. and in 30 markets worldwide. Through a network of affiliates, coverage is extended to more than 70 countries, representing 85% of the world’s advertising spending. In addition, Nielsen collects Internet usage and advertising information through Nielsen//NetRatings. Nielsen Media Research and ACNielsen split up in 1996 as part of a strategic restructuring and came together again in 2001 when VNU acquired ACNielsen (VNU acquired Nielsen Media Research in 1999). 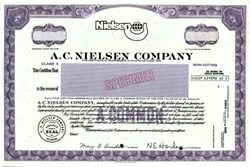 Before 1996, both companies had been part of the A.C. Nielsen Company which was founded in 1923 by a 26 year-old engineer, Arthur C. Nielsen. Arthur Nielsen began his career testing products for manufacturing clients to ensure that they performed up to specifications. Without market research to guide them, companies had no way of knowing how best to spend their advertising dollars. Soon after, Arthur Nielsen essentially founded the field of market research by visiting sample stores in various geographic areas in order to track the movement of different brands, and then informed clients how well their products were doing against the competition - what we would call today "market share" information. Arthur Nielsen's entry into broadcast measurement in the United States began with radio in 1936, that was 16 years after Westinghouse Electric Corp. turned on the juice for the nation's first commercial radio station, KDKA in Pittsburgh. Arthur Nielsen Sr. had attended a demonstration at the Massachusetts Institute of Technology of a mechanical metering device called an "Audimeter" that was designed to track radio listening. The machine was capable of making a minute-by-minute record of when a radio was on and where the dial was set. Nielsen bought the meter practically on the spot, and embarked on a long and expensive research and development effort to improve the Audimeter and to use it on a scientifically selected sample of radio listeners. In 1942, Nielsen launched the Nielsen Radio Index based on the Audimeter and using a national sample of 800 homes. Later, Arthur Nielsen would apply the same measurement technology to the new medium of television, establishing the name "Nielsen" as synonymous with television ratings. The ratings provide estimates of TV audience size and composition. They are a barometer of people's viewing habits. Television reached a 1950s America that was spending and producing as never before, creating the greatest economic boom the world had ever seen. Four networks (NBC, CBS, DuMont, and ABC) were driving the new medium, competing mostly for radio personalities to feed television's voracious appetite for programming. Advertisers were sponsoring entire programs. A "Golden Age" of television eclipsed radio in just a few years. To prosper, however, the new medium depended on reliable, projectable information on which television programs were delivering the right audiences to advertisers. Arthur Nielsen, who had built a successful marketing and audience research company based on a scientific principle of what people did rather than what they thought or said they did, the success of the new medium and the messenger were inexorably bound. Nielsen Media Research continued to innovate in the 1960s and 70s with TV set meters and diaries. Beginning with the 1973 television season, Nielsen Media Research introduced a new metering technology called "Storage Instantaneous Audimeter" for nationwide service. The new Audimeter automatically recorded and stored minute-by-minute tuning records for channel, time of day, and duration of tuning. The data could be stored and automatically retrieved quickly by Nielsen Media Research's computers via the phone line from the home during the night. This resulted in faster service and made possible the introduction of a daily national ratings report which included average audience, share, station count and evening network coverage. Nielsen Media Research's commitment to superior quality and innovation led the company to devote even more resources to the measurement of actual viewing behavior. The Nielsen People Meter, now in approximately 5,000 households throughout the U.S. (including Alaska and Hawaii), represented a major advancement in metering technology, and resulted in more accurate information on television viewership. For the first time, daily household and persons estimates were obtained from a single sample of households. In addition to providing complete data on set tuning, the Nielsen People Meters measure who is watching TV. Each household member, as well as visitors, pushes a button that is assigned to them to indicate they are in the viewing audience.